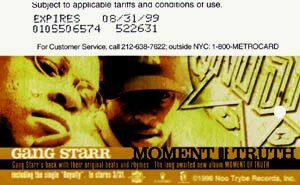 Gang Starr Moment of Truth record release was the reason for this metrocard issue with circulation of 100,000. 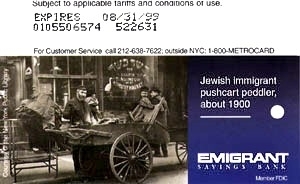 Card was sponsored by Noo Trybe records, Inc. and has images from cover of an album. 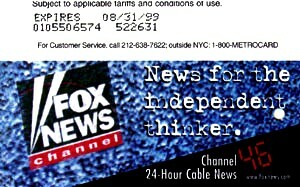 Fox News Channel metrocard issued in 1998 to advertise launch of this channel on TimeWarner Cable channel 46 with the motto “News for the independent thinker”. Circulation is 120,000. Card features logo of the FNC channel on the background of TV screen. 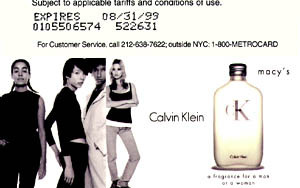 Calvin Klein fragrance for a man or a woman available at Macy’s metrocard issued in 1998 with circulation of 1,000,000 is the first card with advertisement from Calvin Klein. 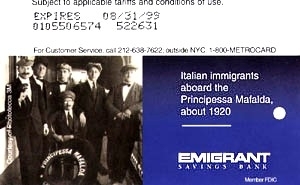 His company used metrocards many times since then. 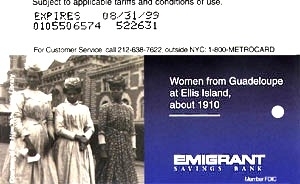 Emigrant Saving Bank first set contains of 8 metrocards each has circulation of 50,000. 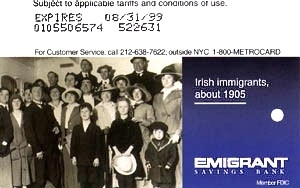 All cards feature black and white photograph of particular group of immigrants with logo of the bank. Cards feature German, Jewish, Irish, Chinese, Gaudeloupe, Italian, Puerto Rican and the last card features images of immigrant children. 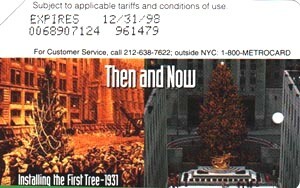 Then and Now: Rockeffeler Center Christmas tree metrocard was issued in 1997 and had circulation of 100,000. It is known with different expiration dates apart as far as 2 years. There is a possibility that it was re-issued in 1998 and/or 1999. 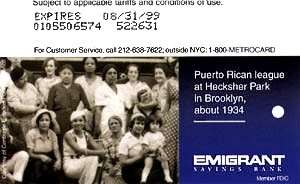 Card has two pictures on it: one from 1931 and another contemporary. Both featuring Christmas tree at Rockeffeler Center in Manhattan. This card has been re-issued next year with the same design different expiration date (1998). 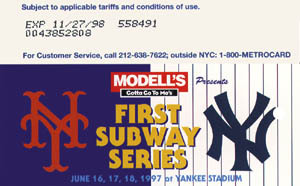 Jackie Robinson metrocard issued in 1997 to commemorate 50 years of Jackie Robinson appearance on baseball field in 1947 and his Foundation. 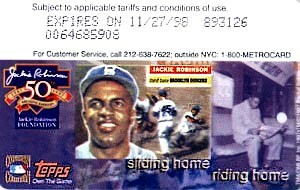 Card has 3 pictures on it: Jackie Robinson, Third base Brooklyn Dodgers and riding in the subway. Card has a motto: “Sliding home – Riding home”. 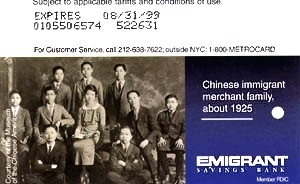 There are 2 versions of this card and different expiration dates. One version was sponsored by “Topps won the game” and another in addition by Queens County Saving Bank. Circulation of this card is 160,000. It is unknown if that number includes both version. 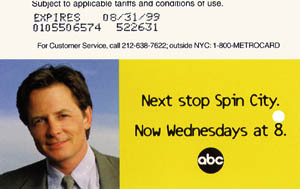 ABC Spin City sitcom promotional metrocard was issued in 1997 and had circulation of 500,000. 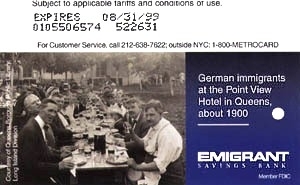 Card features portrait of Michael J. Fox and ABC studio logo. Is is known of at least 2 different expiration dates one year apart. 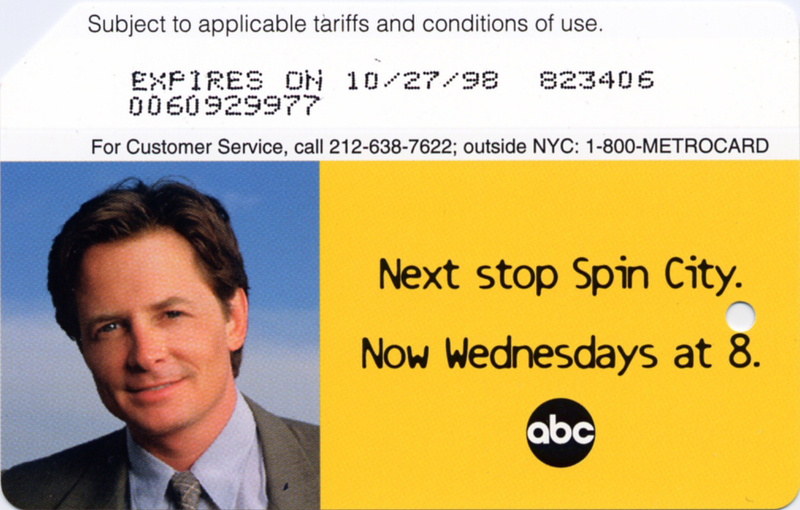 This is the first card with ABC promotion. Next one was made in 1998. This is the first time ABC channel collaborated with MTA. 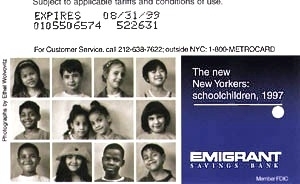 There is second version of this metrocard with different encoding message: “expires on”. 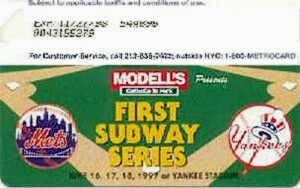 First Subway Series set contains of 3 metrocards each had circulation of 100,000 and each was distributed separately. All cards were sponsored by Modell’s sporting goods chain. 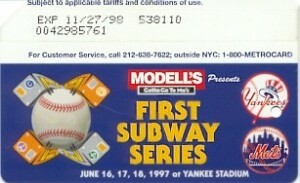 Series itself was held at Yankee stadium on June 16, 17, 18, 1997. Some of those cards were given away at the stadium to ticket holders. 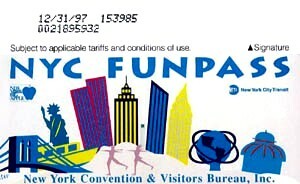 NYC Fun Pass is the second card to promote tourism in New York as first Fun Pass metrocard and has been issued in 1996 this one with circulation of 245,000. This card is known among collectors as ‘white fan pass’ because of very light blue background. City celebrate a championship when Yankees won World series in 1996 metrcoard was made but has been never distributed. Reason for why it was cancel unknown. 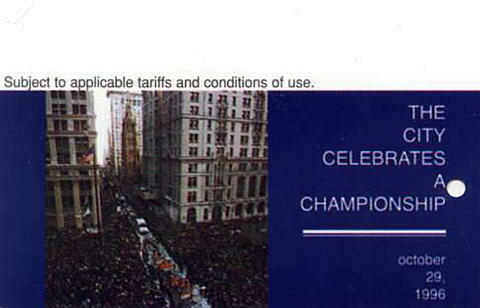 Metrocard features an image of ticketed parade in canyon of Heroes in downtown Manhattan on Broadway.